Bali Spa This spa is owned by Japanese-salon "J.B grace Japan" at Kagawa prefecture. 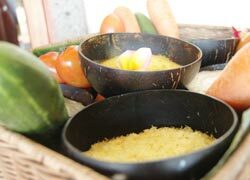 J.B Grace Seaside Spa is popular for high quality service by the Japanese guidance and the seaside location. With the small but cozy atmosphere that the cottages where the hotel is small form a line, a spa is a pretty building of the straw-thatched roof. Massage combines 5 kinds of massages including Thai, Japanese Shiatsu, etc. You can choose one from following below. Gorgeous massage by 2 therapists at the same time. 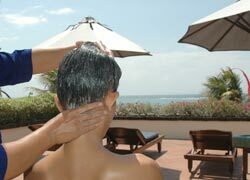 Use plenty of cream; head massage and total treatment for neck, shoulder, and back. Enhance circulation of lymph and remove fat. Kuta, Legian, Seminyak, Sanur, Jimbaran, Nusa Dua and airport are available. Tanah Lot and Ubud,＄20/car (one way)is needed. There are menus for children over age 10.A request that therapist watch the children during the treatment is available. Please, bring your swimwear to use the pool for free. If you have a meal at the restaurant in the bungalow after the treatment, drop-off time can be changed. It was great to be able to see the ocean. 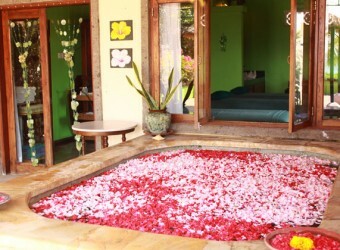 It is a spa with a cozy atmosphere. It seems to be no problem to go to this spa by yourself! I went to this spa with my friend but I think I want to go to this spa by myself next time. It offers ocean view, a very nice location. The spa has a cozy atmosphere, and I think it`s also nice to go there alone!! I went there with my friend on this holiday, and next time I want to go to this spa alone.